In 1997, I (Dr. David Berg) opened my first healthcare clinic and had no idea how to run it. I had just moved from Canada and didn’t have any experience in the U.S. healthcare system. My first year in business I went broke and basically treated people for free. The move itself was a big risk for me and my lack of knowledge was apparent – I even had two Canadian holidays built into the holiday schedule because I didn’t know any better (though our team didn’t mind). The only way out for me was to ask the people around me and my customers what I should do. And they told me. They didn’t like being put on hold, parking in the back, having to wait too long to be seen and they certainly didn’t like copays. Dan Sullivan says, “The customer is your 50 percent partner” and in our case, this could not be more true. So, I simply built our business around the many common obstacles our customers had. I created a 14 minute or less wait time policy, moved all customer parking to the best spots and collected copays after the visit. I didn’t know the impact it would have and in fact, I didn’t realize what we were doing was different than everyone else in healthcare. Since I hadn’t collected a copay before, I didn’t know it was so controversial to change the collection process. I simply let our customers build the business for us. The result was our margins shot up and our customer base grew quickly, requiring that we hire many more people. It wasn’t until later I learned I had made a critical error in the design of our business. 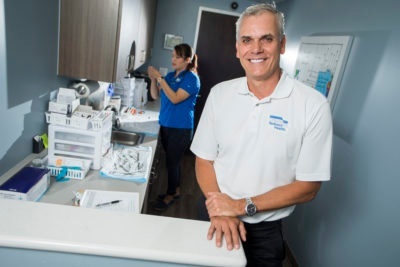 The business was built around an atypical level of customer experience, which meant teamwork, caring deeply about people and having a team who obsessed over our mission of EASY AND TRULY AFFORDABLE HEALTHCARE for families. Without superior people, we couldn’t sustain our level of customer service. This vulnerability was put to the test in 2006 when the labor market tightened. Our best people left our business to join bigger companies that offered better health plans with more affordable deductibles. In the tight labor market, I struggled to attract the talent needed to support our service-based business. Margins went from 20 percent down to 5 percent in 18 months because I was unable to replace our best people. I knew we had a serious business problem and I had to rely on my abilities that were rooted in knowing healthcare. Dan Sullivan taught me to leverage my unique ability, and in my case it was that I knew how to deliver healthcare affordably and exactly the way our customers wanted it. I ran healthcare clinics and had knowledge of cost, pricing, healthcare tricks and hacks, ways to save people from over paying, understanding prescriptions and pharmacies, we’re insiders and know how to navigate the healthcare system. While I knew healthcare, at the time I didn’t know much about insurance, so I made a fundamental mind shift separating healthcare from health insurance and focused on three core action items. Delivering care, getting the fair price for that care, and then figuring out the most cost-effective way to pay for it. When I figured healthcare out, it didn’t take long to have the epiphany that a self-funded insurance funding model was the only way to reap the rewards. Self-funding gave us the freedom to build a plan and system for ourselves that opened up the ability to manage our healthcare spend, tailor the benefits to our workforce and create a very attractive health plan for our team. I leveraged our new affordable benefits to solve our immediate business problem. By offering free healthcare I was able to recruit and retain the best talent within months. Because of what I learned, last year we drastically reduced the second biggest line item on our Profit & Loss from $2.2M down to $586K, which went directly to our EBITDA and bottom line. You heard that right – we added $1.6M to our bottom line this past year by managing our healthcare expense like I would any other large line item. When I separated healthcare from health insurance I continued to learn and focus on exponential simplicity and removing waste and administration. This led to a 7-step process to deliver affordable healthcare to our own employees. Each of the steps play a critical role, but when effectively executed together the sum of the seven steps delivers exponential results. Population Management - Identifying chronic and acute disease, anticipating needs and outreach allowed us to care for the most likely people to create cost in the plan, we created programs to help keep this population healthy and out of ERs and expensive treatments. 24/7 Access to care (Care Logistics) - Convenient over the phone medical support drastically reduced the need for in person visits – this 24/7 access to care eliminated most ER visits and unnecessary trips to doctors for simple things as well like prescription refills or reviewing lab work. In person visits - I also removed copays to help people get care without barriers, this instantly reduced the need for expensive non-routine care. Specialists and Hospital – Managing the hospital and specialist care was also an important part of reducing costs. I learned that by having a provider to provider dialogue, we could not only provide excellent care, but hold other providers and facilities accountable. Fair Price - I learned that the places of service matter greatly and we could get our team the care they need at a fraction of the price by guiding them to the right medical facility and asked for the fair price. Patient Assistance - Our benefit design and knowledge of patient assistance programs allowed us to leverage alternative ways to fund healthcare beyond insurance. Insurance - And finally, by placing insurance at the end of our seven-step process – we have never used this healthcare funding mechanism in the last 10 years which has resulted in low-costs and no increases. During the recession, as our business grew, I saw my friends' businesses struggling with huge insurance hikes. Many of them had the same problems with attrition by not being able to provide affordable healthcare to their teams. I couldn’t just stand by and watch. The self-funded healthcare strategy I had in place was so effective, that I knew I could help our friend’s businesses get through the recession by implementing our self-funded strategy in their business. And that’s exactly what I did. Healthcare was such a large item on many of their P&Ls, that they were not only able to stay in business, but grew into large thriving businesses. Through this process, I realized my passion for helping businesses and sharing our strategy with others. In 2013, I created Redirect Health with a mission to make healthcare easy and truly affordable for everyone in small and medium-sized businesses. The past few years has seen rapid growth and Redirect Health now offers care in all 50 states.